Here is a nice little piece of advice. 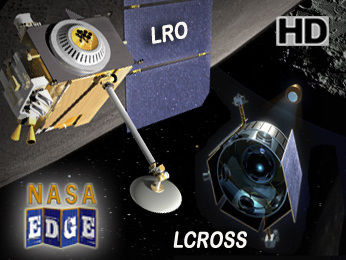 Download the LRO/LCROSS vodcast (https://www.nasa.gov/multimedia/podcasting/nasaedge/NE00_LRO_LCROSS.html), watch intently, save up some money, go buy a nice lawn chair, a good 10-12 inch telescope and invite over some friends for one of the coolest scientific events since JJ Abrams decided to make the prequel to the Star Trek TV series. My friends, witness LRO and LCROSS. Of course, the LCROSS impact won’t happen for a few months, and by that time LRO will have plowed through many of its objectives. But what you might be able to see (I’m probably not correct about the specifics of my party preparation advice) is the impact plume of LCROSS’s Centaur module after it slams into the surface of the Moon. Ordinarily this kind of destructive behavior is limited to Mythbusters, but NASA stands to gain tons of scientific data that will help us understand more about our Moon. Perhaps we will bust a few myths in the process. When you see the show, you’ll know a little bit more about what I mean. Be sure to check it out. Of course, if you have questions and comments, please leave them here. I’ll be checking. I’m trying to plan my own LRO/LCROSS impact party, and I could use a few good ideas. 1) LRO/LCROSS is just cool. All of this information AND lunar impacts?! 2) You won’t be able to see the impact(s) from everywhere. Keep checking the website for observing updates throughout the mission. 3) I’m glad that you talked to Jennifer Heldmann. One of my favorite planetary scientists! 4) There is a great article on LCROSS that was in an issue of Popular Mechanics. It is on their website and is worth reading. 5) No mention of Delta IV by the LSP? What gives? Make sure to have cake in the shape of LRO and LCROSS! I had a star cake for my star party. I did not know much about LRO/LCROSS before. This sounds very cool! I can not wait for NASA to get back to the moon! Let the years fly by faster!!!! Note – We can’t use external links due to NASA rules and regulations.